Science isn't all lab coats and beakers. Students taking science classes tackle subjects such as weather patterns, animal behavior, and natural habitats. Roll those subjects into one and you've got some of the hottest science subjects in the news today, global warming and environmental management. 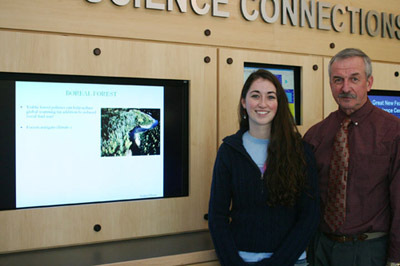 After months of walking past the plasma screens in the Science Center , Geography Professor Al Rydant began thinking that these subjects would make an interesting addition to the campus announcements and weather station read-outs that were displayed there. Instructional Technology Liaison Wendy Petschik liked his idea and reserved one of the screens for the presentations. He found inspiration in a calendar that spotlights the endangered places and animals of British Columbia , and enlisted the help of junior Casey Moran to create some informative PowerPoint presentations. Moran is a junior with a double major in Geography and Elementary Education, so she is getting a little practice in what it takes to create something a student might, hopefully, learn from and find interesting. PowerPoint is a staple program in classrooms and office environments, and was one of the more popular workshops offered by Instructional Technology during the winter break. Moran knew the basics of PowerPoint when she started the project, but found that the basics weren't always enough to keep the four-slide presentations interesting. Instead of relying on plain color backgrounds she figured out how to use photos as backgrounds. The photos helped make the background interesting, but then she had to worry about if the text would be clear enough to read. Once she knew the text was visible, she experimented with different ways to present it. PowerPoint gives users a variety of animations; from a fade-in to bouncing the text around the screen before placing it. PowerPoint allows the user choose how to advance from slide to slide as well. Slides or animations can be advanced with a mouse click, but this is only good if someone is available to control the presentation. Moran needed the points and slides to come up automatically, and the presentation to loop continuously. Custom animation tools allowed her to time the appearance of text and photos on individual slides, and determine how long each slide should stay on the screen so people wouldn't have to speed read from one slide to the next. It took a little bit of poking around the program, but Moran gained some valuable experience that she can take to the classroom with her when she begins student teaching. “You could use (PowerPoint) with any grade level too,” she said. The presentations are a simple use of common software that will give passers-by information, and hopefully act as a call for resource protection and habitat stewardship, according to Rydant. Moran is creating approximately 10 presentations based on the habitats, flora and fauna featured in the calendar, and will probably create one presentation based on a service learning trip to Ecuador that she and Rydant will participate in over spring break. Contact Academic Technology to find out what possibilities are available to you.